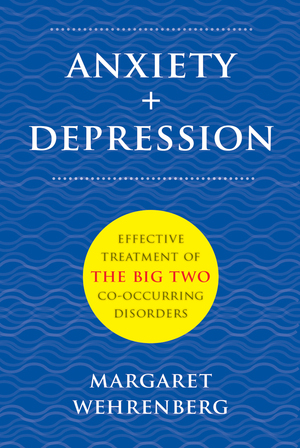 Anxiety + Depression - Description | W. W. Norton & Company Ltd. Tips and techniques for managing a prevalent co-existing condition. Depression can rob an anxious client of the energy needed to control her symptoms; acute anxiety can make anyone depressed and exhausted; and what happens when anxiety masquerades as depression, or vice versa? What are the signs that this is happening? It’s hard enough to treat these two disorders when they exist on their own, and it gets even harder when they present together. In her customary practical style and conversational tone, Margaret Wehrenberg unravels the complexity of this common comorbidity, teaching therapists exactly how to tackle it. Beginning with “Where to Start?”, she walks readers through a variety of common tricks for distinguishing between anxiety and depression, and provides an assessment plan for determining which set of symptoms the client is most ready to work on. The book goes on to highlight seven common types of comorbid clients, who can be arrayed on a spectrum, from the “low energy” (depressed) on one end to the “high anxiety” (anxious) on the other, and everything in between, including the “hopeless ruminator,” the “quiet avoider,” and the “high-energy anxious and depressed” client. By organizing the book around these typical client profiles, readers are given a more realistic picture of what comorbid anxiety and depression look like and how to best help their clients. Wondering where depression ends and anxiety begins, or vice versa, and how you can most effectively help your clients when they’re struggling with both? The key clinical strategies offered in this book provide a practical roadmap forward, helping therapists and their clients to better understand the symptom picture, manage its effects, and heal.